Chocolate Industry report is an MBA project which gives you the detailed report about the business of chocolate in India. 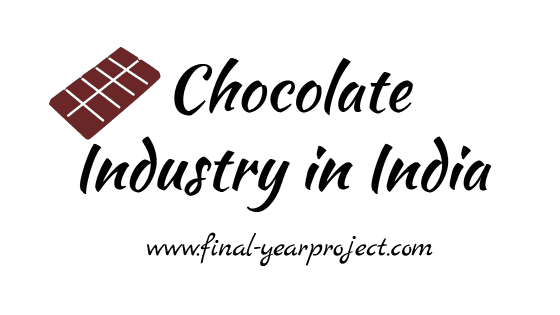 This project aims at understanding the overall Chocolate Industry in India, the product portfolios of different players in the market, various factors affecting the growth and success of chocolate industry in India, the challenges and opportunities which the market offers and the changing trends in the Indian Chocolate Industry. The project also covers a brief study of Cadbury’s India with reference to above points. Subscribe to FINAL YEAR PROJECT'S by Email for more such projects and seminar. The chocolate industry in India as it stands today is dominated by two companies, both multinationals. The market leader is Cadbury with a lion's share of 70 percent. The company's brands (Five Star, Gems, Eclairs, Perk, Dairy Milk) are leaders their segments. Till the early 90s, Cadbury had a market share of over 80 percent, but its party was spoiled when Nestle appeared on the scene. The latter has introduced its international brands in the country (Kit Kat, Lions), and now commands approximately 15 percent market share. This report contains detail information about chocolate industry in India and you can also get Chocolate manufacturing process in this report. Please format this report as this is not formatted well. You can use this for reference and study.